I started fishing this morning at a spot that normally produces throughout the day. Being that it was a Wednesday, I only had a few hours till I had to get into work so I was hoping for a morning bite. The weather was pretty nasty so getting to the spot took a little longer than usual. With snow in the air and a slight breeze across the ice, I started punching some holes. With fresh holes, A buddy and I stared making our way through the grid looking for what was below us. The were there and we caught a bunch of bluegill, rockbass, and pumpkinseed. As the sun rose higher, the quality of panfish decreased quickly. The longer we stayed the more frustrated we got. Finally coming to our senses around 10, we packed up and headed to a pond that we had talked about but never tried through the ice. After obtaining permission to access the lake from a side that allowed us to shorten out walk on significantly we loaded up the sleds for the second time of the day. With life jackets on and ice picks ready around our necks, we began walking out to the starting point we intended to fish. The ice was about 4″ everywhere we went. Soon enough, we had a large area over deep water dissected and ready for fishing. A few holes into the area I marked a fish right on the bottom. Looking for bluegill this was a welcomed sight in 32 feet of water! The drop down to the bottom seemed to take forever and when I reached the bottom the results weren’t much more impressive. I worked the fish five times before giving it a break. I checked a nearby hole to see if the fish had slid over. With no fish nearby, I went back to the original hole. On the drop back down, a mark started to rise. Thinking it was a ghost mark I dropped right by it continuing on to the bottom. As I passed it, the fish turned and chased it down. Realizing it was a fish I cranked back up and hooked up with the first fish of the day. 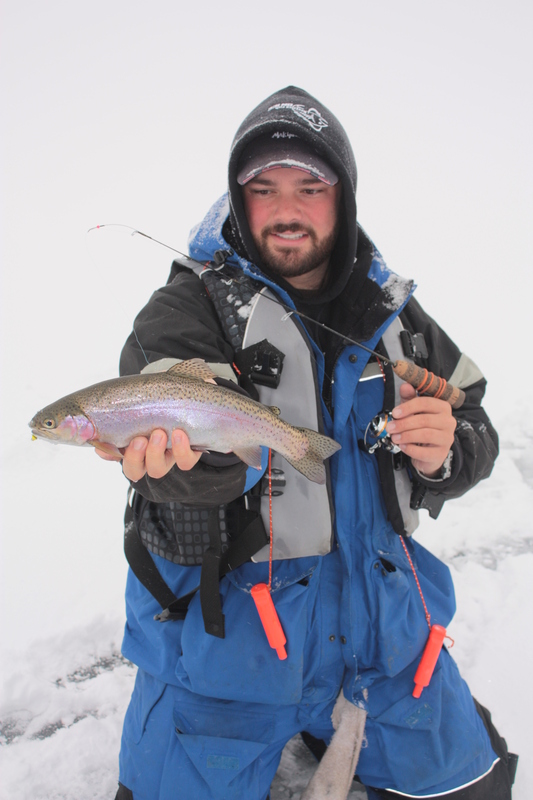 After bring in the fish another 20 feet I had a 14″ rainbow on the ice. Being that trout season was not yet open, we kept moving and searched a bit shallower. Targeting a 25′ flat, we punched a bunch of holes. A few drops into the section, I snapped off on a large fish as soon as I turned it. With no time to think about what happened, I retied and quickly had to drop my rod to help my buddy with his first catch! As I turned around to see my buddies rod doubled over with the drag screaming, I pulled out my camera phone and started recording. 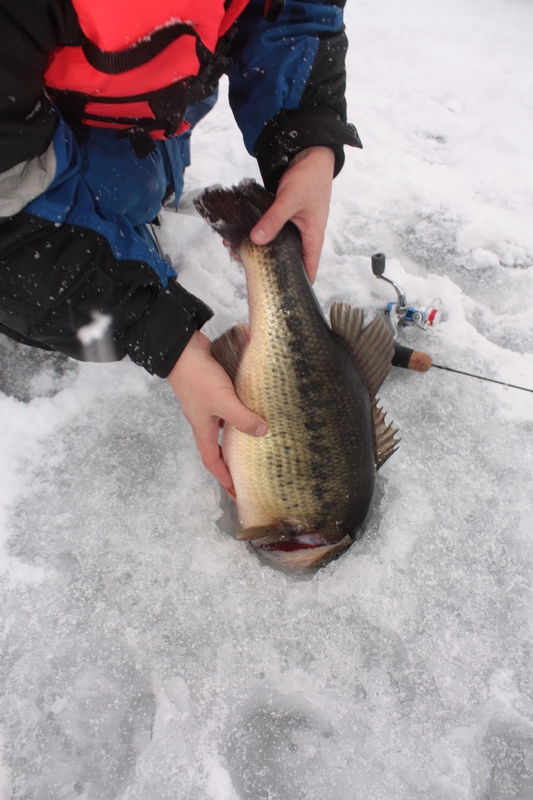 After about three minutes of battling, the fish finally made its way through the thin ice. When you have to pull a fish through a 6″ hole you know it’s a good one! As the fish squeezed through the hole, its 24.5″ length amazed us of what we had stumbled upon! 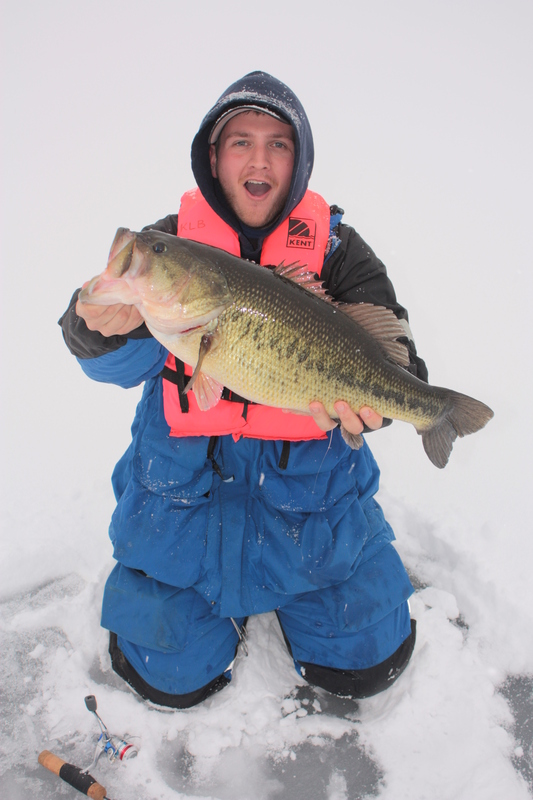 Not only is this fish spectacular for Vermont, it would be a trophy fish through the ice anywhere. After a few pictures we stuffed the fish back down the hole and got back to fishing. The next hour was slow. We looked shallow, deep, and in weeds for the magic depth that was holding bluegill with no luck. All in all it was a decent way to spend the hours leading up to work! Check out Giant Bass on our YouTube page for more footage! Previous Post1-15-13 – Crappie DayNext Post1-21-13 – Back To Fishing! That video was great too. Good day on the ice! My Lord, that had to be a 7 or 8 lb bass! Great video! We thought 8.5 after we both had held it. Our friend had caught one there that went 8 pounds and this one was an inch longer.